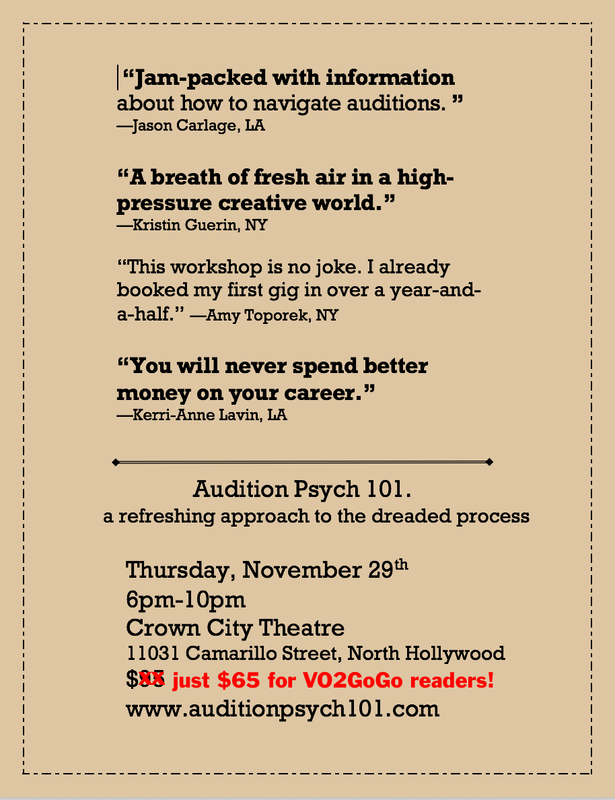 You are here: Home › A 30% Discount On Audition Psych 101 – This Thursday! Auditioning can be the most stressful acting processes we’re required to engage in. I watch people sweat bullets in the waiting room, and, when asked how I approach auditioning, always have the same piece of powerful advice: take Michael Kostroff’s Audition Psych 101 workshop. Now. 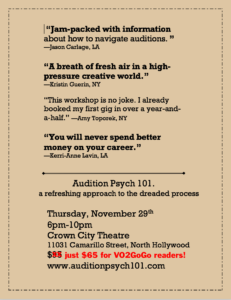 Want to take a quantum leap in audition expertise? Want to get rid of the things that keep you up at night when you know you have a really important audition? And aren’t they all important? Will you be in LA on Thursday? Want to know what this amazing actor has to say about auditioning? Don’t make the mistake of creating any rules for yourself about auditioning that aren’t even close to being true. Don’t create any rules for yourself about auditioning that aren’t even close to being true. Happily, he’s giving it all away in an awesome live seminar, a gleefully big package with a beautiful bow on it, called Audition Psych 101. And he’s coming back to LA – on Thursday, November 29th, 2018, at 6p, at the Crown City Theater, on Camarillo in North Hollywood.